The Birthday images on this CD are from many different scrapbooks that date from 1924 to 1966. Most of the cards on this Cd collection are from the 1940s. This collection has a large number of husband/wife/sweetheart cards. There's a good collection of florals, some bluebirds, some animals, some cartoon type and some nautical. 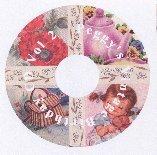 This CD contains scans of 102 vintage cards with 227+ images and 91 sentiments.